With the Dow Jones Transportation average sitting at the highest level in 3 years, let’s remind ourselves why this is so important. When Dow Theory was being developed over 100 years ago, the railroads were a vital link in the economy. The theory argued that many times activity would begin in the Rail Average before the Industrial Average. This was attributed to the fact that before economic activity began, raw materials would have to be moved from the suppliers to manufacturers. Before General Motors ($GM) could increase production, more steel would need to be transported. Therefore, an increase in activity among the rail stocks would foreshadow an increase in business activity for the industrial stocks. There is no doubt that today’s economy is much different and the makeup of the Dow Jones Transportation Average (formally the Dow Jones Railroad Avg) has changed to favor the airlines. 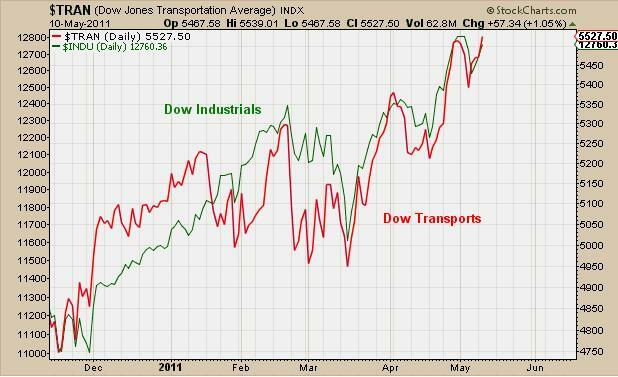 However, there is still some credibility in using the Transports to confirm movements in the Dow Industrials. Transport stocks are much more dependent on the economic environment than the average stock and will likely foreshadow economic growth. Buy/Sell Signals: For a primary trend buy or sell signal to be valid, both the Industrial Average and the Transportation Average must confirm each other. If one average records a new high or new low, then the other must soon follow for a Dow theory signal to be considered valid. Yesterday the Dow Jones Transportation Average closed at a new high. The Industrials are less than 1% away. This is something we to watch here guys.